It’s the 20th week of the year and the card of the week is the Wheel of Time. 2+0=2, a number of duality. And with the sun entering Gemini this week, we kick off the season of opposites attracting. Day and night, masculine and feminine, light and dark — they all come together to balance each other out. If you feel that your life is out of balance, a spin on the Wheel of Fortune may bring a change of luck. If you feel frustrated, be patient. Nothing stays the same and change is on one way. 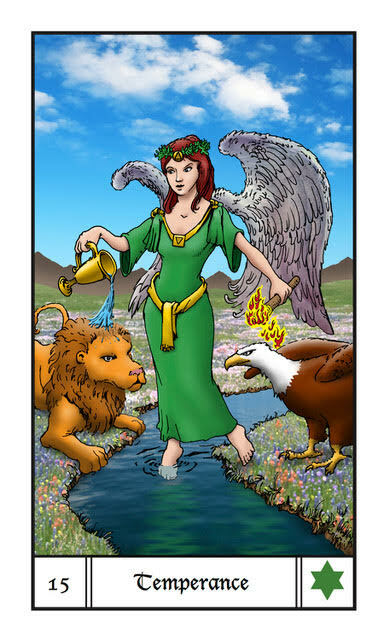 Temperance is a card that appears to remind us to have patience, even when things aren’t going your way. It will all make sense in time. Moon sextile Neptune at 2:51 AM PST is a psychic intuitive transit. Moon square Jupiter is generally a positive, upbeat transit but it could lead you to an inflated ego. If you are asleep during these transits, they may appear in your dreams. Moon conjunct Pluto at 1:23 PM PST is an intense, emotional transit that brings obsessive, overwhelming energies to the surface. Remain grounded. Mercury enters Taurus today at 9:07 PM PST where he will stay until 6/6/16. While Mercury is in Taurus, people may take time making decisions not because they’re putting things off, but because they want to make sure the decisions they make are the right ones. The Moon is in the sign of the teacher Capricorn today so whatever happens today is meant to teach you patience. The number of the day is 3, a number that reminds us no matter how many delays we face (it still is Mercury Retrograde post shadow period) things are coming together in the background whether we realize it or not. Mantra: Everything in due time. 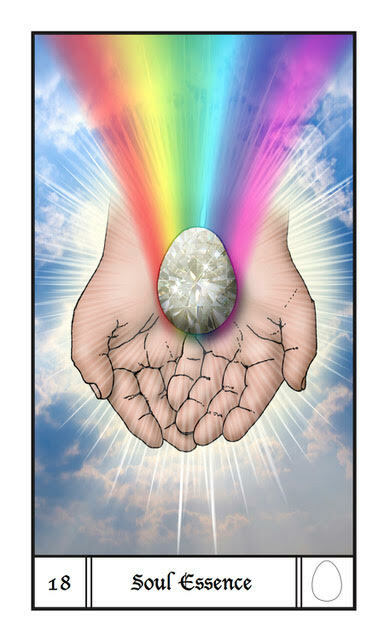 The Soul Essence card is a card that was added to the Tarot by Richard Harnett to update the architypes for modern times. When this card appears, it means that you are in flow with the Universe and everything it has to offer you. You’re on the right track. Don’t look back. Moon trine Sun at 2:17 AM PST is a transit of happiness, harmony and flow. Moon square Uranus at 3:22 AM PST is a transit of rebellion for rebellion’s sake. If you’re looking for excitement, do something productive instead of causing conflict. If you are asleep during these transits, they may appear in your dreams. Moon square Mercury at 11:55 AM PST is a transit that could cause problems in communication. Avoid serious conversations about important matters until this transit passes. The Moon is void of course between 3:22 AM PST and 10:50 AM PST when She enters the rebellious sign of Aquarius. Make today a day to set your soul free. The number of the day is 4, reminding us that many times, we must lay a foundation for change and build the life we want to lead rather than taking drastic moves to bring it about quickly. Mantra: Do what your soul speaks to you. 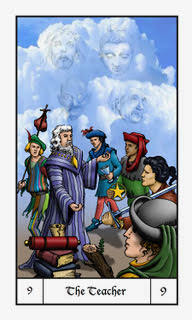 The Teacher is a card that was added to the Tarot by Richard Harnett to update the architypes for modern times. When this card appears when there is to a lesson to be learned from a teacher who will appear. Will you be the teacher or the student in this situation? Moon sextile Venus at 11:09 AM PST is a card of love, beauty and creativity. Express yourself freely. Moon trine Jupiter at 2:16 PM PST is a upbeat, jolly transit that will keep the good feeling from the morning flowing. Moon trine Mars at 10:38 PM PST is a transit where you will be able to convert your strengths into leadership skills and take control of whatever task is at hand. The Moon is still in the extroverted sign of Aquarius today so reach out and connect with others today. The number of the day is 5, a number of overcoming challenges. 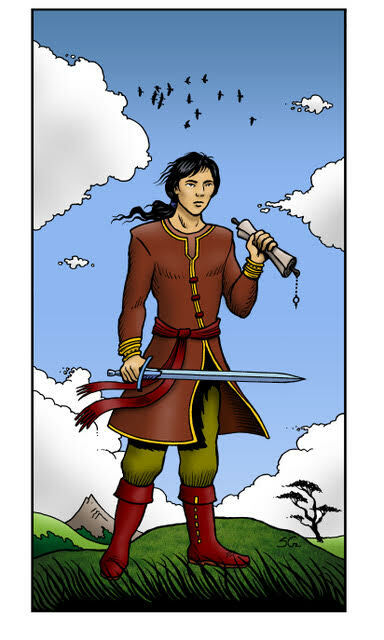 The Page of Swords has so many ideas in his head but his thinking is so fast that he may have trouble focusing. The message of the Page is to stay grounded and focus on what matters the most. If you do that, you’ll find yourself becoming more productive. Moon sextile Uranus at 2:01 PM PST once again encourages us to try something new and connect with new people. Just don’t forget your old friends in the process. Moon sextile Saturn at 2:06 PM PST is a transit that allows you to accept whatever it is you have to do whether you want to do it or not. Moon square Sun brings the Last Quarter in Aquarius. If you are feeling that you were prevented from achieving you goals this month, figure out what was holding you back and work around that during the next lunar cycle. Saturn trine Uranus at 11:19 PM PST is a transit that brings balance between the way things were and the way they are now. This transit brings patience and acceptance as you realize that once again, anything worth doing takes careful consideration, planning and time to manifest. The Moon goes void of course as she enters the Last Quarter in Aquarius. Then she will enter the flowing sign of Pisces at 8:52 PM PST bringing a catharsis that comes after a burst of energy. The number of the day is 6, a number of victory. Mantra: The only time we have is now. 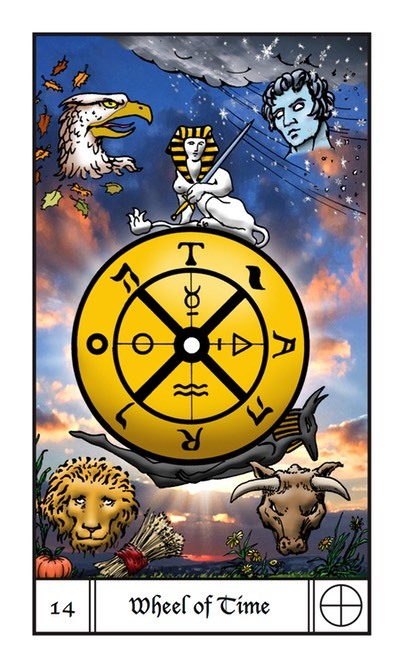 The 8 of Wands appears when there are delays in your future. You could feel frustrated waiting for something to happen or you may miss a very important step that will cause delays further down the line. Whatever the case, there’s nothing you can do about it except have the patience to work through this challenge. Moon sextile Mercury at 2:38 AM PST is a transit of flowing communication. Take advantage of this transit to dot all your i’s and cross all your t’s. Venus opposition Jupiter at 7:12 AM PST is a lucky transit filled with satisfaction. Take time to pamper yourself and indulge in the pleasures of life and try not to worry about what’s coming down the line. Relax and take it easy. The Moon is in the easy going Pisces so don’t stress. The number of the day is 7, which means that even though things aren’t going exactly as you want, things are still pretty good. Upright the Queen of Wands is a social butterfly who uses her charisma to win the hearts of many. But when reversed, the Queen’s fire is out of balance. She is easily angered, spiteful and ready to get revenge on whoever crosses her. If she represents you, try your best to not lash out at people today. If she represents someone in your life, tip-toe around the Queen today to avoid her wrath. Moon sextile Pluto at 8:04 AM PST is a transit that reveals deep secrets but these issues will come to the surface for the better. Moon square Mars at 9:28 AM PST is a transit of volatile, emotional instability. Try to get some exercise to bring yourself back into balance. The Sun enters the dualistic sign of Gemini today where He will stay until 6/20/17. While the Sun is in Gemini, expect swift flowing communication and amped up creativity. People may also be flakey due to rapid coursing ideas. Moon square Saturn at 8:39 PM PST is a transit that may cast a shadow over the evening. Accept that you are just in a bad mood and move forward from there if you find yourself feeling down. The Moon is in the flowing sign of Pisces and goes void of course at 8:39 PM PST. Let any confrontations or intense emotions just flow right by. The number of the day is 8, a number of infinite cycles. Mantra: Life has its ups and downs. Roll with it. 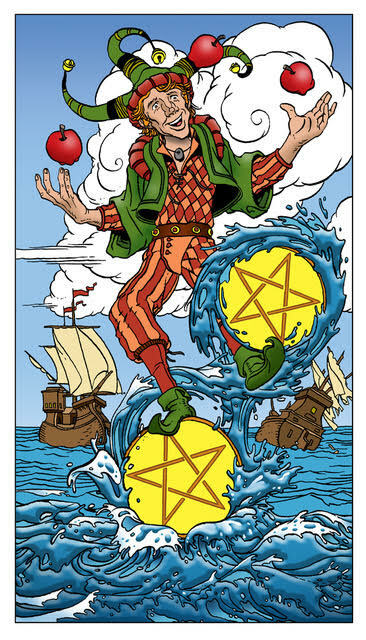 The 2 of Pentacles appears when you are doing such a good job of balancing all the many different things that you have to do in your life that people wonder how you are able to do it all. However, if you feel tired and unable to keep up, give yourself the break you deserve. Moon sextile Sun at 4:12 AM PST is the only exact transit today. This is a happy transit filled with light and love. Enjoy it and don’t spend the day slaving away. The Moon enters the fiery sign of Aries at 3:11 AM PST. Get out and do something physical today, whether it be going to the gym, taking a bike ride or working in the yard or something else, a day spent out and about doing something that is a break from normal routine will be a day well spent. The number of the day is 9, a number of endings becoming beginnings. Mantra: There’s time for work and time for play, take a break today. This entry was posted in art, Astrology, dreams, Evolutionary Tarot, Jupiter Retrograde, Mercury Retrograde, mysticism, mythology, numerology, occult, Pluto Retrograde, Saturn Retrograde, self help, spirituality, Tarot, witchy, Writing and tagged abundance, art, astrology, card a day, divination, dreams, empowerment, inspirational, magick, manifestation, mantra, meditation, metaphysical, motivational, mysticism, numerology, occult, predictions, psychic, self empowerment, self help, spiritual, spirituality, tarot, tarot reading, tarot weekly forecast, wicca, witchcraft, witchy, writing. Bookmark the permalink.